The Health Meter is an on-screen indicator of how much health the player character currently has left. It usually appears somewhere on the top of the screen as part of the HUD, but can also appear in other locations on the screen as well. The Health Meter varies from game to game on how many sections it has. The Life Gauge from Super Mario Bros. 2, with Luigi sprites reflecting its status. In Super Mario Bros. 2, the Health Meter (known as the Life Meter or Life Gauge) appears in the top-left corner of the screen at the start of each level, and consists of two hexagons arranged vertically. These hexagons were later changed to hearts in the Super Mario All-Stars remaster of the original game as well as in Super Mario Advance. Each section of the Life Gauge represents one hit point each. Normally, the hexagons or hearts will be red. When the player is damaged, however, one health section will be lost, and will turn white instead of red (in the All-Stars remaster and the GBA remake, it will turn concave and empty). The character will shrink when they have one hit point left; this state persists between levels and is the starting form for each life in Super Mario Advance. Sections of the Life Gauge can be replenished by collecting small hearts (which are bigger in the GBA remake). These hearts can often be found floating upward from the ground after eight enemies have been defeated (in the original and All-Stars versions) or floating in place, appearing after a thrown object beats two enemies in a row, from Mega Guys or Giant Ninjis to the ground thrown or beaten, from enemies beaten with shells, from beaten Ostros, or by pulling them up from grass (in the GBA version). In most levels, there are up to two (three in Super Mario Advance) Mushrooms hidden in Subspace which will refill the Life Gauge and each increase its sections by one, up to a maximum of four (five in Super Mario Advance). It will then revert back to just two health sections at the beginning of the next level. In Super Mario 64, Mario's Health Meter (known as the Power Meter) is normally not displayed on the screen until he takes considerable damage from falling or touching enemies, etc. When it does appear, it is displayed on the top middle of the screen. In this game, it is a wooden profile shaped like Mario’s head, with a circle in the middle that displays eight health sections. When he takes damage, some of the sections will gradually disappear. The color of the health sections corresponds to the number of health sections that remain after he has taken damage: Eight to seven are blue, six to five are green, four to three are yellow, and two to one are red. Mario can refill his Power Meter by collecting various coins: Yellow Coins will replenish one section, Red Coins will replenish two sections, and Blue Coins will replenish five sections. He can also refill it by running through Spinning Hearts, which can be found in most if not all of the levels. The faster he runs through them, the more health he will regain. When the Power Meter reaches two sections, Mario will begin to pant when standing still. This is only a cosmetic effect as he can still perform moves. An alarm also plays when Mario is underwater. If the Power Meter runs out at any time, Mario will lose a life and forcibly exit whatever level he is currently in (excluding Peach’s Castle, where he is just placed outside the building). If Mario loses his last life, he will be given a Game Over. In this game, Mario's Power Meter also acts as his breath meter when he dives underwater. After he dives underwater, the health sections will gradually deplete. When only two sections remain, an alarm will begin to go off; if Mario does not surface before the two sections have completely run out, he will drown and lose a life. On the flip side, if Mario remains in the water with his head above the water, the Power Meter will completely refill to eight. However, the freezing water in Snowman's Land and Chief Chilly Challenge (Super Mario 64 DS only) depletes his health much faster than normal water, even if he is on the surface. Mario also will not refill any health lost from freezing water. The Power Meter will also automatically refill immediately after Mario exits a level after collecting a Power Star if it is not already filled. The Power Meter appears again in the remake, Super Mario 64 DS, where it acts the same, though with two additions: When the player changes characters or when they grab a Power Star that does not force the character out of a level, like Bowser stages Red Coins or 100-coin Stars, the Power Meter fully refills. Also, while the player is in the maze with the toxic cloud, if two sections are left and any character is still in the toxic cloud, the warning sound that is heard usually underwater will be heard. In volume 16 of the Super Mario-Kun, which is mostly adapted from Super Mario 64, the Power Meter occasionally displays Mario's power level, usually at a very low point. 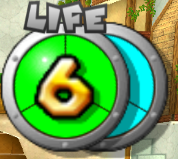 Mario's Health Meter in Super Mario Sunshine. In Super Mario Sunshine, Mario's Health Meter is shaped like a stylized sun, with a polygonal spiral shape at the center. Again, it will not visibly appear onscreen until Mario takes damage. When it appears, it is positioned in the top right corner of the screen. There are once again eight sections of health, with each section represented as a sunray around the central spiral. Mario's Health Meter in Super Mario Sunshine as it is displayed when he is underwater. It is normally a golden-orange color when completely filled, and each individual section will "flash" when completely filled. When Mario takes damage, the rays of the sun will gradually become blacked out to signify the loss of energy. When they have been blacked out, they will no longer flash. He can regain energy by collecting normal Coins, which will refill one section, or Red Coins and Blue Coins, which will refill two sections. Energy can also be regained by collecting a 1-Up Mushroom, which will completely replenish every section of the Health Meter immediately upon collection. When the Health Meter has lost five sections of energy, an alarm will start to sound for the remaining three sections of health. As each section after this is gradually lost, the alarm will sound faster, and the energy sections will flash to match its warning. As it gets gradually lower, Mario will start to droop lower and lower, visibly getting weaker from the lack of energy. When it has been completely depleted, Mario will lose a life. If he has no remaining lives, he will receive a Game Over. The Health Meter will automatically be fully depleted if Mario falls in Lava, touches Spikes, gets crushed, fails a timed Red Coin challenge, or loses a race to Il Piantissimo. Unlike in Super Mario 64, there is a separate meter for Mario's air meter when he is underwater. This meter is blue, and the health sections continually deplete underwater. When the meter is depleted to three sections, an alarm will sound as it gets steadily lower, and will continue to do so until Mario collects a coin or returns to the surface. Mario's Health Meter in Super Mario Galaxy. In Super Mario Galaxy, the Health Meter appears in the top right hand corner of the screen after Mario or Luigi has taken considerable damage, or after Mario/Luigi has remained inactive for a certain period of time. It is shaped like a circle and has a total of only three health wedges as opposed to eight in the previous two games. Mario's Health Meter in Super Mario Galaxy 2 after he has collected a Life Mushroom. One of the new features of this game involves the inclusion of a new item called the Life Mushroom, which will increase Mario’s Health Meter from three to six when it is collected. However, if at any time the health sections drop back below four, the Health Meter will revert to a maximum of three sections until another Life Mushroom is collected. Mario's Health Meter in Super Mario Galaxy 2 under Daredevil Comet conditions. The coloration of the regular Health Meter in this game is as follows: three sections are cyan, two are yellow, and one is red. The additional three sections that are added as a result of the Life Mushroom are all colored in green, and do not change the color unless the Health Meter drops below four. As neither Red Coins nor Blue Coins appear in this game, they cannot be used to refill Mario's Health Meter when it gets low. Instead, he must seek out regular coins, which can be collected after defeating most enemies and will refill one section of his Health Meter. Purple Coins make their first appearance in this game, but they do not affect the Health Meter in any way. When the Health Meter drops below two (and there is only one section left), a warning alarm will begin to sound. This will continue until Mario is able to pick up at least one coin, which will fill it up again. Also, the Health Meter is different from Mario’s air meter when he swims underwater. The meter that does appear when he is underwater is similar to the meter that appears when Mario is flying as Bee Mario. Mario will only start taking damage underwater when his air gauge has been fully depleted, at which point his Health Meter will be quickly depleted as well. At the beginning of every Daredevil Comet mission, Mario's Health Meter is automatically decreased to just one health wedge (the only difference being that no alarm will sound under these conditions), forcing Mario to complete the mission without taking damage once. The Health Meter in Super Mario Galaxy 2 looks and behaves in the same way as it did in its predecessor. One minor difference is that if the player collects another Life Mushroom while one is still in effect, and all six sections of the Health Meter are filled, he will receive a 1-Up. If the Health Meter is at less than six sections, it will instead be refilled to that amount. In both games, Mario's Health Meter will be depleted immediately if he falls into a black hole, is crushed by a Thwomp, Whomp, Rhomp, or Tox Box, falls into quicksand or poison, touches dark matter, or fails a timed Purple Comet, Speedy Comet, or Romp Comet challenge. After an absence in Super Mario 3D Land and Super Mario 3D World (due to those games using the power-up system of the 2D Mario platformers), the Health Meter reappears in Super Mario Odyssey with three sections of health, as in Super Mario Galaxy. This time, Hearts are required to restore lost health instead of coins. Collecting Power Moons, touching a Checkpoint Flag, or going inside the Odyssey can also restore health. It can be extended to six with a Life-Up Heart. Unlike prior iterations, the meter has a flat, solid-color appearance, and the cyan and green colors are swapped from their Super Mario Galaxy positions. When dying, Mario will lose ten coins instead of a life, as lives and Game Overs are absent in this game. In Assist Mode, Mario starts with a default of six health wedges, which is extended to nine when he collects a Life-Up Heart. Also, the Health Meter refills itself if he is idle, and if he falls into a pit, he only loses one section (instead of all of them and ten coins) and is sent back to his previous location in a bubble (instead of the most-recently activated checkpoint). Mario's default Health Meter in Super Mario Odyssey. Mario's Health Meter in Super Mario Odyssey after he has collected a Life-Up Heart. Mario's default Health Meter in Super Mario Odyssey while playing in Assist Mode. The Health Meter as seen in the game Yoshi's Story. In Yoshi's Story, the Health Meter (or Smile Meter, as it is also called in this game) is depicted as a smiling flower which appears in the upper left-hand corner of the screen during gameplay. Normally, the Health Meter will have a total of eight sections, signified by the eight white petals positioned around the circular center of the smiling flower. In addition to displaying the health of the Baby Yoshis, the Health Meter in this game also represents the current mood of the Baby Yoshis. When a Baby Yoshi takes damage from touching enemies or other hazards, the petals will begin to gradually fall away from the center of the flower, starting with the topmost left petal and going counterclockwise. It is also recommended that Baby Yoshis should not eat some things such as Peppers or Black Shy Guys because they will lose petals from the Smile Meter unless it is Black Yoshi or White Yoshi. In addition, the face of the flower will slowly change from a smile to a frown. When this happens, the color of the face on the flower will also change and the music will wind down (but not to a halt) a happy version to a "sad" version (pitch lowers greatly as well as the speed slowing down greatly). The face will start out being orange, and will turn yellow as health is lost, eventually turning blue when no flower petals remain at all. A Baby Yoshi can only take damage up to eight times before the flower will start frowning (as there are only eight petals on the flower). If the Baby Yoshi is hit one additional time while the flower's face is frowning, the little dinosaur will faint and be captured by Baby Bowser's Toadies. The player can regain health by having a Baby Yoshi eat various fruit. When the Baby Yoshi eats fruit, any lost petals will return to the flower and it will begin smiling once again. In Yoshi Topsy-Turvy, the Health Meter appears in the top-left corner of the screen as a smiling orange sun with eight white triangle shaped rays around it. Each of these triangle rays represent one section of health, for a total of eight sections. This variation of the Health Meter is very similar to the one from Yoshi's Story in both shape and color. When Yoshi touches an enemy or other obstacle, health is lost, signified by some of the white triangle rays falling away from the sun in a counterclockwise direction. As more and more health sections fall away, the loss of energy will begin to be reflected by the sun's expression. It will start out being orange with sunglasses and a large smile. When some rays have been lost, its color will fade to yellow, it will lose its sunglasses, and its smile will diminish slightly. If Yoshi sustains more damage, the expression of the sun will remain the same, though more of the sun's rays will be lost. When no more of the sun's rays remain, the face of the sun will turn blue and begin frowning. If Yoshi sustains any more damage after this, the face of the sun will turn green, then gray, resulting in Yoshi losing a life. In Yoshi's Woolly World and its 3DS port, when Yoshi takes damage, the Health Meter appears around Yoshi as a circle of hearts. One heart represents one health section, up to 20 hearts. When one heart is left, the heart will look cracked and the Health Meter will always show, alerting the player to get more hearts. If all hearts are lost, the player must restart the level from the beginning or the last checkpoint they touched. The health meter in Yoshi's Crafted World looks the same as in Yoshi's Woolly World, except the hearts are made out of paper to match the game's style. If Yoshi completes a level with all 20 hearts, he receives a Smiley Flower. In Super Princess Peach, the Health Meter reappears. The player starts with three hearts on it, but the player can get more from Toad's Shop, although each level is only started with three full hearts filled in. When the player takes damage or falls into a bottomless pit, they will lose a half-heart of the Health Meter. When their Health Meter is fully depleted, it will be Game Over, and they will return to the map screen to try again. Perry refers to health as HP. The Health Meter in Mario Sports Mix. The Health Meter in Mario Sports Mix is used only in dodgeball matches, as well as the dodgeball mini-game Bob-omb Dodge. It is shaped like a circle with a black line going down the top half of its middle and ending at the circle's center. Depending on the character that the player is currently using, the icon shown in the top corner of the Health Meter will change accordingly. The player should note that in this game, the Health Meter will appear along the top of the screen for every character that is currently playing. This Health Meter also appears in the game's final battle against Behemoth and the Behemoth King. When the player's character is hit by a dodgeball or another item, such as a Bob-omb, some health will be lost. The amount of health lost will depend on the item the character is hit with, as certain items will cause more or less damage than others. In any case, when a character is hit with an item, the chunk of health that is lost will flash red briefly before disappearing completely, leaving a black space in its place. If a character is hit by a special attack, a large amount of health will be lost. If the Health Meter for a certain character is depleted completely, that character will be out for the rest of the match (rest of the mini-game if Bob-omb Dodge is played). In the Super Smash Bros. series, the Health Meter always appears at the bottom of the screen, except in Super Smash Bros. for Nintendo 3DS, in which it is displayed on the touchscreen. It acts as a damage counter which displays the amount of damage that a particular character has taken as a percentage. The higher the percentage goes, the more damage the character has taken. As the character takes more damage, the color of the percentage will gradually change from white to a dark red, and the character will simultaneously become easier for the opponents to KO them. The highest amount of damage a character can possibly take is 999%. Food, Heart Containers, Fairy Bottles and Maxim Tomatoes can help reduce the amount of damage that a character has taken. In all games, the Health Meter appears for each character that participates in a match. Aside from displaying the damage of a character, the Health Meter will also display other information. For example, in Super Smash Bros. Brawl, the name of the character will always be displayed directly under the damage percentage, and an icon of the character's face will be displayed to the left of the damage percentage (at the top in the earlier games). The symbol signifying the series that the character comes from will appear behind the damage percentage. In Stock matches, up to five circles (represented as character heads in the first two Super Smash Bros. games and Super Smash Bros. for Nintendo 3DS / Wii U) will appear above the damage percentage representing the amount of Stock that the character currently has left. One of the circles will disappear for every time that the character is flung off the screen. When the character has no circles left, they will be defeated and the character will be out for the remainder of the match. In Time matches, the number of KOs is shown above the damage percentage. A point is earned or lost if the character KOs an opponent or gets KO'd, respectively. In Coin Matches, the number of coins in hand is displayed. The Health Meter appears in various boss minigames throughout the Mario Party series. It can be represented as hearts or a bar. Once the boss's health is depleted, the minigame is won. As of Mario Party 9, the player who deals the final blow will get an extra point bonus to their score. In some minigames, players also have a Health Meter, and when they lose all health, they will lose the minigame. In Donkey Kong Country Returns / 3D and Donkey Kong Country: Tropical Freeze, the Kongs' health is measured in hearts. Donkey Kong naturally has two hearts – two more if he carries a partner with him, as well as an additional one if a Heart Boost is equipped. Each time the Kongs get damaged, they lose one heart from their Health Meter. If all of their hearts have been depleted, they lose one life. Hearts can be found along the way and are used to replenish the primates' health bar. The second pre-release Health Meter design from Super Mario Galaxy. The Health Meter in the pre-release version of Super Mario Galaxy originally had a total of eight sections, like in the first two 3D Super Mario games. It featured the same coloration as in Super Mario 64, although later the green and blue colors were switched. The Health Meter in the pre-release version of Mario Sports Mix looked very similar to the Health Meter from Super Mario Galaxy and its sequel, except it had four sections instead of just three. A flower that resembles the Health Meter from Yoshi's Story appeared in the minigame Loves Me...? from Super Mario 64 DS. Super Mario 3D Land and Super Mario 3D World are the only 3D Mario games to not include a Health Meter, opting instead to use the power-up system of the 2D Super Mario platformers (except for Super Mario Bros. 2) and as such are the only 3D Mario platformers to feature the Small form. Super Mario Bros. 2 is the only game to feature both the Small form and a Health Meter, as well as the only 2D Super Mario game with a Health Meter. ↑ Super Mario Advance manual, pg 18. ↑ Super Mario All-Stars Limited Edition manual, pg 31. This page was last edited on April 23, 2019, at 23:36.